Foldable phones raise a lot of questions, chief among them being how do you protect one. You obviously can't install a tempered glass protector on a foldable phone but you might be able to put it in a case. 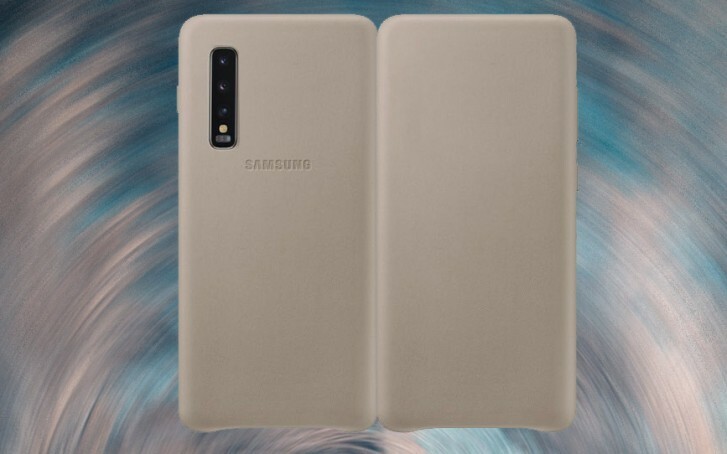 When it comes to the Samsung Galaxy Fold we've seen early renders of Spigen cases and now we learn Samsung will make its own leather case for the Galaxy Fold. It's not clear what a Samsung-made leather case for the Galaxy Fold will look like (image below is just our mockup) but it makes sense to use a flexible material such as leather. The case likely won't come cheap either - Samsung's leather case for the Galaxy S10+ is €50 - but seeing as how the Galaxy Fold costs $1,980 we don't think early adopters would squint at expensive cases. LED case like the one for S10. Maybe its something like Clear View cases? You know, the see-through case Samsung made. Theu should had add LED case for the rear function. A combo of both for this expensive device; I dont see any rich people mind paying for such thing.